Video of our own Cheryl Watson, filmed by Greenpeace on their recent visit to Gladstone. This entry was posted in Newspaper Articles on December 16, 2013 by A..
CRUCIAL sediment testing in Gladstone Harbour demanded by the Environment Department was not completed before the Federal Government approved the controversial Western Basin dredging project in 2010. The sediment tests were requested after regulators found initial 1000-borehole testing provided by Gladstone Ports Corporation was lacking in several areas. The revelation comes just days after the Federal Government approved Arrow Energy's LNG project, and follows news that the State Government is investigating a private lease of the port. A key area of the Environment Department's request for additional testing was near the RG Tanna Coal Terminal - where molluscs were experiencing the rising effects of a highly toxic chemical (TBT) in 2009. The GPC did not give that information to authorities at the time. Documents obtained under Freedom of Information revealed the port filed an "exemption from further sediment testing" in July 2010. Regulators found the initial testing regime was incomplete the next month. But despite the concerns, and without the data requested, the Federal Government still approved the largest-ever dredging project in the Great Barrier Reef World Heritage Area, in October that year. Additional results were not provided until April 4, 2011. They were not released. But a GPC spokeswoman said the results were within national dredging guidelines, and that no contaminants exceeded the guidelines, with the exception of locally occurring metals. She said GPC applied for the exemption as the port "believed that sufficient evidence existed to evaluate the footprint". But APN Newsdesk has obtained correspondence that shows regulators knocked back the exemption application, over concerns that the distribution of tests were "uneven and not representative of the whole dredge phase area". Despite the omission of the study on TBT from the EIS potentially breaching federal environment laws, the department said it did "not consider an investigation into this matter is warranted". A port spokeswoman said the GPC applied for an exemption, "which was not granted by the Federal Government". "GPC then undertook the additional sampling required to meet the National Assessment Guidelines for Dredging, the regulatory guidelines mandated by the Federal Government," she said. This entry was posted in Newspaper Articles on December 14, 2013 by A.. The opinions stated in this article are the author's own. This article is in response to an article which appeared in the Sydney Morning Herald on 14 December 2013. Source: http://www.smh.com.au/environment/animals/survival-is-winning-the-numbers-game-20131213-2zcm6.html or click here. "Tasked with trying to save almost 1000 threatened plant and animal species in NSW, the O'Farrell government is undertaking a version of "conservation triage" where scarce funding will target species with the best chance of survival. Spending priorities will be ranked according to a cold calculus: the benefit of intervening to save a species, multiplied by the likelihood of success, divided by the cost." Firstly, I'd just like to say this: If you are in a triage situation, you are in a war. And the other side is winning. Let's just analyse the situation here from an external perspective. The only reason there is scarce funding, is because the government doesn't allocate it, unlike what appears to be unlimited funding to subsidise the fossil fuel industry. So the formula is flawed from the start because funding to save threatened species is not limited. It is only limited by political expediency within the government. "the benefit of intervening to save a species, multiplied by the likelihood of success, divided by the cost." I guarantee that 'benefit' in the NSW government's mind, is 'political benefit' not 'ecosystem services benefit'. This is clearly demonstrated that what will get funding is in the 'cute and cuddly' range. If you added ecosystem services in, some earthworms might be more worth preserving than some bludging koala that eats leaves all day. 'Success' is not defined either, and I humbly submit that having a couple of breeding pairs hanging about in a zoo is not success. That is failure. And exactly what is the cost to my unborn grandchildren of not having these species on earth? To go to Christmas Island and to hear only silence where before the air was full of the calls of the tiny pipistrelle bat? Hugh Possingham says in the article: "It's not any different from running any other business," ... "Everybody in the world, every day, is doing a cost-effective analysis." With respect Hugh, you're doing it wrong. You are all doing it wrong. You are all perpetuating an economic system which does nothing but harm to the planet and by extension, to ourselves. We need to be doing everything differently. We need to change how the whole economic and political system works. And this is not about communism or lefty ideology. This is about survival. Of all of us. And by 'us' I mean every damn species on this tiny blue ball. Every single one is worth preserving. Every single one. I do not accept your ranking system. Apply it to humans and you soon get fascism - some people are worth preserving and some aren't. It's a slippery slope to a very nasty place. I do not accept your economic argument. Sometimes the most effective things that people can do to preserve a piece of their environment do not cost any money at all. It requires us to refrain from doing something. To not spend the money on the new shopping mall, but to stick with what we have. To not chase after material possessions that don't make us happy anyway. I do not accept you and your slippery politics. If you really wanted to save threatened species, you would fund on-ground action instead of yet another plan which wastes trees and allows these precious gems of DNA to slip through our fingers forever. Having worked in the on-ground part of the environment sector for many years, I know whereof I speak. I know the slimy caveats you put on funding. I know all about the consultation round-a-bout which produces yet another plan every 10 years and does nothing practical. And let's be clear, when I say 'you' I mean every politician who thinks that money is more important than the pipistrelle. The fact is, our economic and political system is failing us badly. It is rotten at the core. Time for a new paradigm. Source: http://www.theage.com.au/environment/mining-bigger-threat-to-reef-than-agriculture-says-scientist-20131211-2z6f0.html and http://www.smh.com.au/environment/mining-bigger-threat-to-reef-than-agriculture-says-scientist-20131211-2z6f0.html or click here. Mining poses a greater threat to the health of the Great Barrier Reef than agriculture, says one marine scientist who has cast doubt on the federal government's prediction that water quality will improve along the reef coast. On Tuesday, federal Environment Minister Greg Hunt gave the green light to the dredging and dumping associated with four coal terminals, the building of a LNG refinery and pipeline on the Great Barrier Reef coast. Environmental conditions attached to the approval include an undertaking that water quality would improve by 150 per cent through a reduction in farm-related sediments flowing into the marine park. But research scientist at James Cook University's Australian Centre for Tropical Freshwater Research, Jon Brodie, said mining activities presented a greater threat to the reef than agriculture. Agricultural activity within the Great Barrier Reef catchment area, such as beef grazing and farming releases sediment, chemical and fertiliser run-off. This is discharged from rivers into the sea. However, Mr Brodie said the damage from the expansion of ports, including dredging sediments contaminated with heavy metals, could prove a greater threat to the health of the reef because - unlike run-off from agriculture - port development was occurring without any transparent and productive management of the risks. The area off Abbot Point, where 3-million cubic metres of seabed will be dredged and dumped as part of the expansion, is near marine habitats, such as coral reefs and seagrass meadows that provide shelter and food for fish, turtles and dugongs. Cloudy water reduces the reach of sunlight that corals and seagrasses need for growth. Mr Brodie said it was ''one more stress [on the reef] that could have been avoided''. Gladstone Conservation Council treasurer Cheryl Watson said the government would not have approved the projects if it was serious about protecting the reef. Among them is Arrow Energy's LNG refinery at Boatshed Point on Curtis Island, off Gladstone in Queensland. The new refinery will be the fourth on the island, which is part of the Great Barrier Reef World Heritage area. Mrs Watson said while the southern part of the reef was 40-kilometres away, there were pockets of coral reef within Gladstone Harbour that would be vulnerable to industry growth. ''It needs to be protected because it's part of a wider ecosystem,'' she said. The United Nations Educational, Scientific and Cultural Organisation is due to rule on whether the Great Barrier Reef should be added to its ''World Heritage in Danger'' list next year. This entry was posted in Newspaper Articles on December 12, 2013 by A..
Hysterical? I’ve got a right to be. From the above article which you can read in full here: "Queensland Resources Council chief executive Michael Roche praised Mr Hunt for using the weight of scientific evidence to put Queenslanders ahead of "increasingly hysterical environmental activists"." Interesting. The usual dismissal of anyone who opposes big business as somehow weak and foolish. If there is anything I have learnt from being a parent, it is that children get hysterical when they are ignored. So, yes I am hysterical. Also, I am apoplectic with rage and I am miserable with despair. I am furious that not one sitting member of the ruling party in Queensland is actually listening and acting on our genuine concerns about the planet's life support system. The weight of the scientific evidence is that the coal in the Galilee Basin should be left in the ground, for the ultimate benefit of all Queenslanders. Now I am not some bleeding heart hippie type person. I am perfectly capable of killing my own dinner and have done so. I grew up in the country, where there is no leeway for squeamishness when there is a job to be done. I am the proud possessor of not one, but 2 university degrees and a diploma. I have a degree in Science and one in Law, plus the diploma to allow me to be a solicitor. Some might call that over-educated, but in the field of climate science that barely qualifies me to have an opinion. And my considered, non-hysterical opinion on the latest decision by the Queensland Government is that it is insane. How can we be approving yet another massive coal port in such a sensitive area, let alone approving the dredging that will be required? 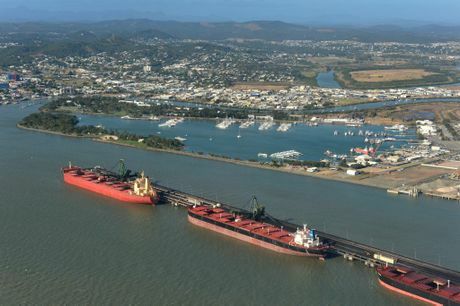 The evidence from the Port of Gladstone is that dredging severely damages ecosystems. And the particular ecosystem we are talking about is smack bang in the middle of the Great Barrier Reef. This ecosystem is of such beauty and importance that it has been protected by the world. That's right, the whole world thinks we should protect it. And what is our government doing? It appears to be doing its best to destroy it in a stupid temper tantrum. I have no political leanings - this government and the previous one appear to be indistinguishable from each other and even the Greens are now doing dirty deals. The thing is, once it's gone, it's gone. You can't bring back an extinct species, whatever Jurassic Park would like you to believe. So yes I am getting hysterical, in the hope that if I shout loud enough, maybe someone making these decisions will hear me and look at the science. This entry was posted in Newspaper Articles on December 10, 2013 by A.. It's not like Gladstone has a lot of cultural heritage. Unlike some other old settlements in Australia, there aren't a lot of historical buildings around. Which makes it all the more important that what little we have is protected and preserved. Site No. 8: Ruins of rendered brick building. These photos were taken by Cheryl Watson in 2012. Our concern is this: by what right does a multinational destroy our children's cultural heritage, even if they promise to "Record the ... sites in detail prior to construction and destruction" (EIS Table 25.2 - C25.02). There are people living in Gladstone right now who are descendants of the pioneers who built these items. Perhaps in the grand scheme of things, these buildings have limited historical value. Perhaps in the grand scheme of things, the people of Gladstone are unimportant. Nevertheless, this is where we live, and we must protect our heritage. After all, once these buildings are destroyed, they can never be replaced. And all this for someone else's short term profits? It's a betrayal of our children for 'thirty pieces of silver'. Site No. 1: “Birkenhead” outstation. Site No. 2: Grave at “Birkenhead” outstation. Site No. 3: Post cutting site. Site No. 4: Old yards. Site No. 5: Stock enclosure. Site No. 6: Historic fence line (will be partially destroyed). Site No. 10: Former dairy site/fisherman’s hut. Site No. 7: Pre-1870 track alignment. Site No. 9: China Bay yards occur in the project area for the LNG jetty and would be completely destroyed during construction. However, this site is likely to be impacted or destroyed prior to the construction of the LNG jetty because it is located within the construction footprint of the Santos Gladstone LNG project materials offloading facility, which is under construction. This site will be destroyed and no mitigation is required under the project. Site No. 11: Various fence alignments (Targinnie) may be disturbed by the construction of TWAF 8 if found to be located within the project area. This entry was posted in Newspaper Articles on December 3, 2013 by A..